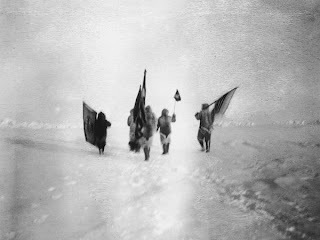 One day's march from their destination, members of Admiral Robert Peary's Arctic expedition tote flags across the polar ice. 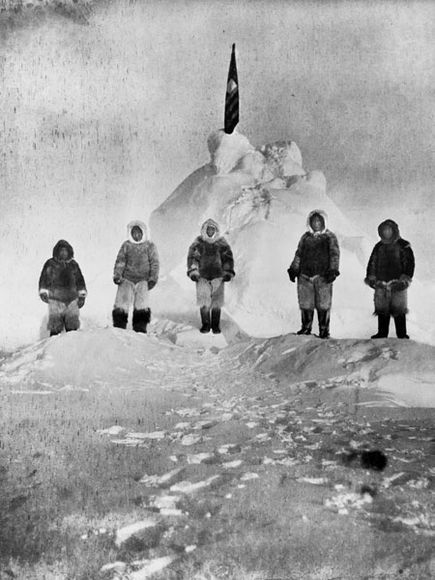 In the early morning hours of April 6, 1909, a triumphant Peary and his team—now just two sleds and five companions—reached what they believed was the North Pole. 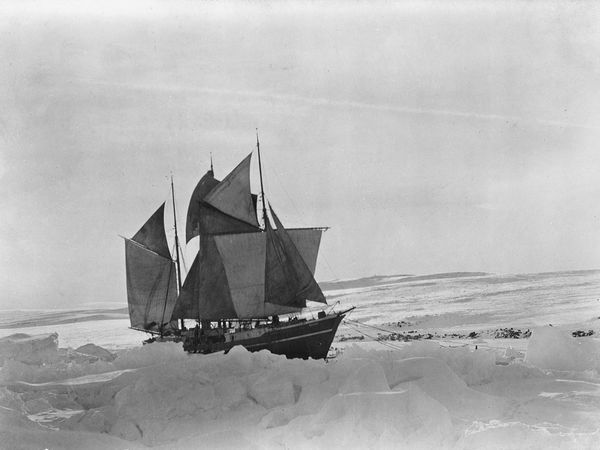 Admiral Robert Peary's third and final attempt to the North Pole began aboard the Roosevelt, a steam-engined battering ram with a reinforced bow designed to smash through Arctic ice. 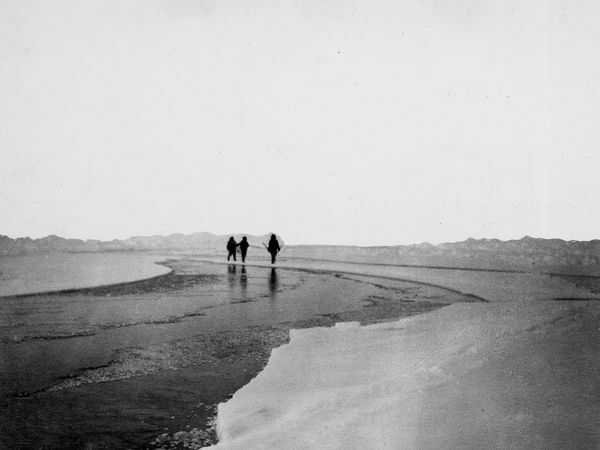 After departing from Oyster Bay, Long Island (where namesake President Theodore Roosevelt was among the onlookers), Peary and his crew steamed to Cape Sheridan, the northeastern point of Canada's Ellesmere Island. Here they began building camp and breaking trail to the Pole. 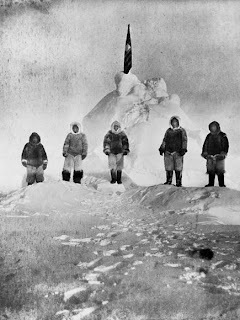 On April 7, 1909, expedition members dole out 1,500 fathoms (9,000 feet/2,740 meters) of line in an attempt to find bottom near the Pole. 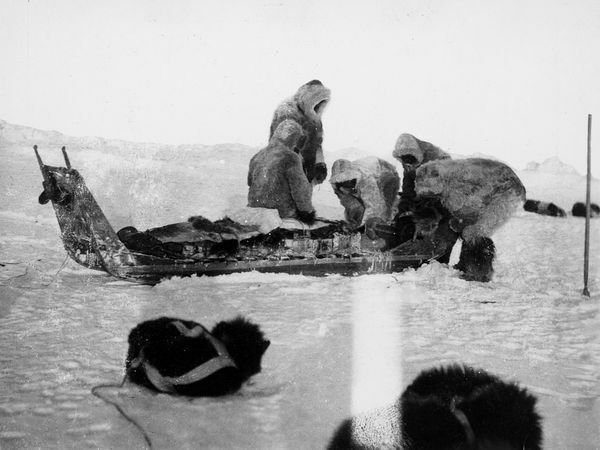 After taking the sounding, the 80-pound (36-kilogram) apparatus was left in order to lighten one of the sledges. 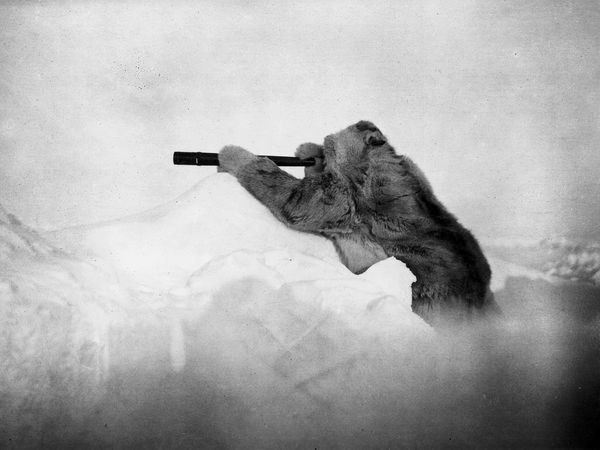 After several failed attempts, 23 years of effort, and a lifetime of obsession with the Arctic, Admiral Robert Peary led in April 1909 what was then believed to be the first successful expedition to the North Pole. His stalwart crew, pictured here, included Inuits Ooqeah, Ootah, Egingwah, and Seeglo and fellow American Matthew Henson. 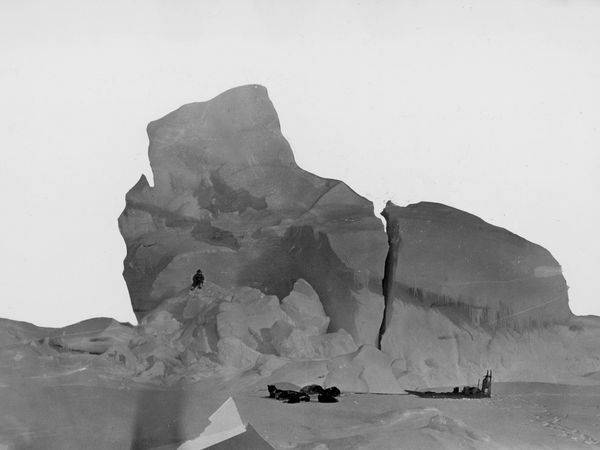 Later studies found that Peary was actually 30 to 60 miles (50 to 100 kilometers) short of the Pole. Buffeted by wind and snow on Greenland's northernmost point, Kap Morris Jesup, Admiral Robert Peary surveys his route. In the years before his final Arctic expedition, Peary made several trips to Greenland to collect giant meteorites, which he hauled back to the U.S. to use in fund-raising lecture circuits. Some of these meteorites, including a 4.5-billion-year-old, 34-ton specimen, are now displayed in New York’s American Museum of Natural History. 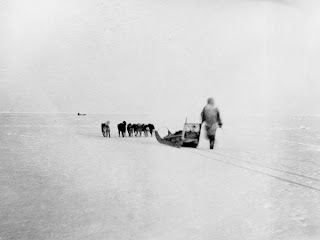 Riding behind a supply sled pulled by dogs, a member of Admiral Robert Peary's Arctic expedition team makes his way across a thin stretch of young ice on the Arctic Ocean, near 87° north. Peary's team covered 475 miles (764 kilometers) from their main camp on Ellesmere Island's Cape Columbia to the North Pole. They preferred flat terrain, pictured here, but often encountered pressure ridges, craggy mountains of ice formed from colliding ice floes. 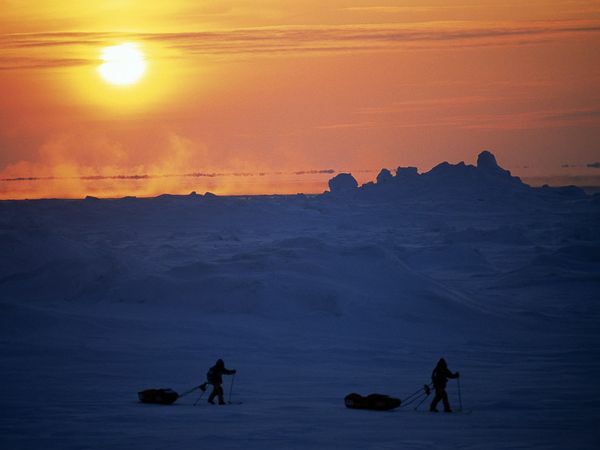 Members of Admiral Robert Peary's team survey their route over a frozen stretch of the Arctic Ocean. Years of experience trekking the Arctic led Peary to adopt an Inuit lifestyle to adjust to the extreme Arctic environment. He and his crew, most of whom were Inuit, wore Inuit garb, slept in igloos, nourished themselves with whale meat and blubber, and traveled by dogsled. Supplies from the Roosevelt scatter the base of an iceberg between Cape Sheridan and Cape Columbia on Ellesmere Island in Nunavut, Canada. Among the ship's crew and cargo were Matthew Henson, Peary's longtime assistant; 49 Inuit men, women, and children; 246 sled dogs; 70 tons of whale meat; and the blubber of 50 walruses. A weak Arctic sun provides little warmth to two expedition members pulling supply-laden sleds across the Arctic ice. Since Robert Peary made his Arctic expedition in 1909, others have made novel attempts to the Pole—by airship in 1926, by plane in 1952, and by submarine in 1959. 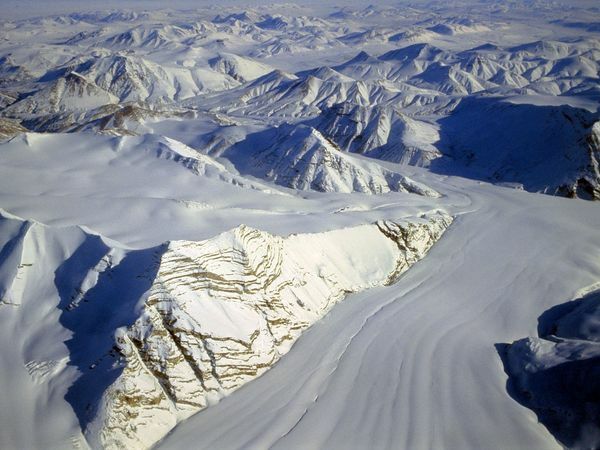 The North Pole continues to lure explorers into the 21st century.